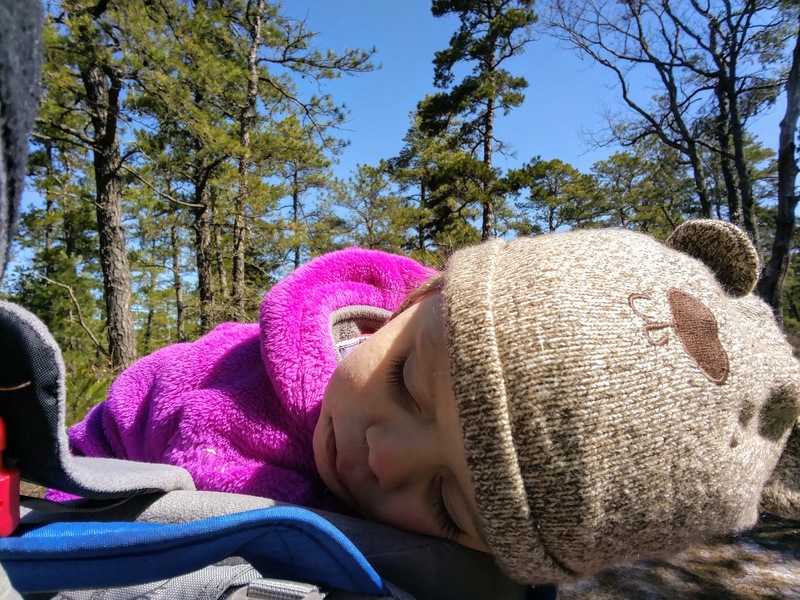 Ultralight Alice, all-season adventure girl, went on her first backpacking trip this weekend: One sub-freezing night out and back in the Pine Barrens with Daddy. These are some notes & observations. There are more photos in the gallery here. 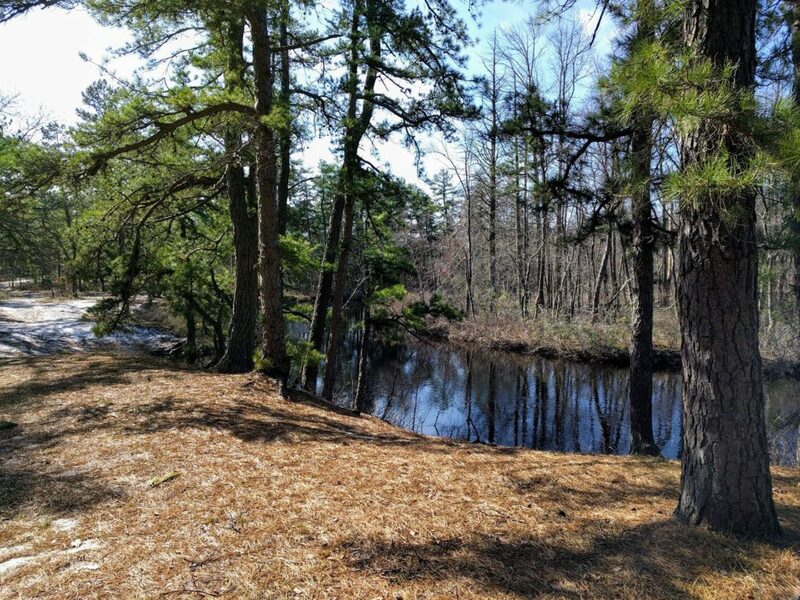 We camped at the Mullica River Wilderness Campground in New Jersey’s Wharton State Forest, about halfway between Atsion Lake and Batsto Village and only reachable by kayaking or hiking from either of those. We started from Atsion, a 5.5 mile hike (Batsto is 4 miles). 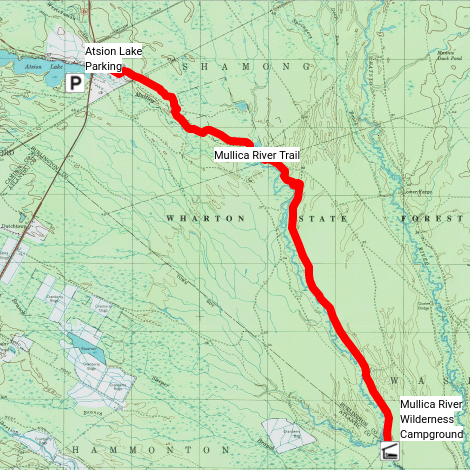 I’ve never really been to Atsion Lake but it has some special meaning for me as a major milestone and inflection point on many of the ultra-endurance cycling routes I was doing often a few years back. So I got a little extra kick out of going there, though given the time of year & weather we didn’t stop by the lake’s rec area at all. The trail comes out on water at many points. River landing at the campground. In hindsight I think some friends and family have mentioned going to this campsite in the past. 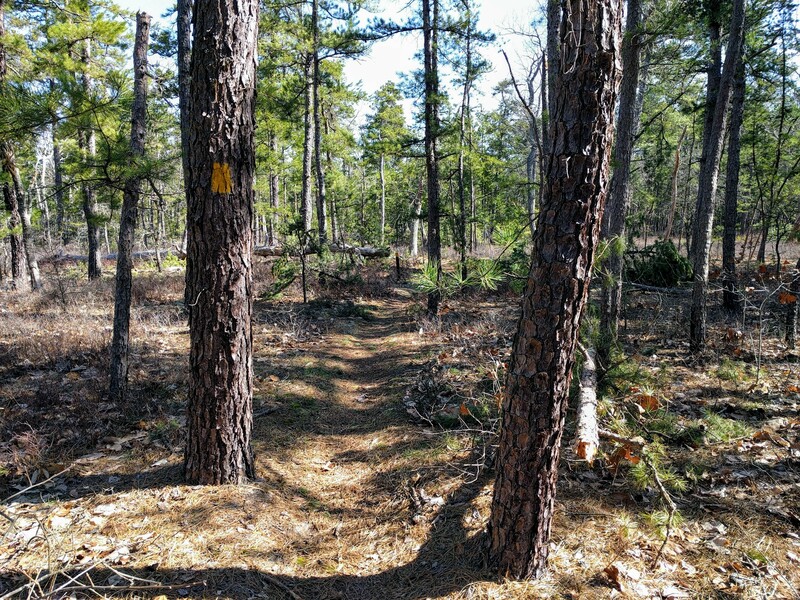 But I first really came across it while looking around for trails to do with kids and reading SouthJerseyTrail’s trip report about backpacking there with a young child. A good sized group of cub scouts were at the campground with us, the only other people around, and the leaders also remarked that they take groups there often. 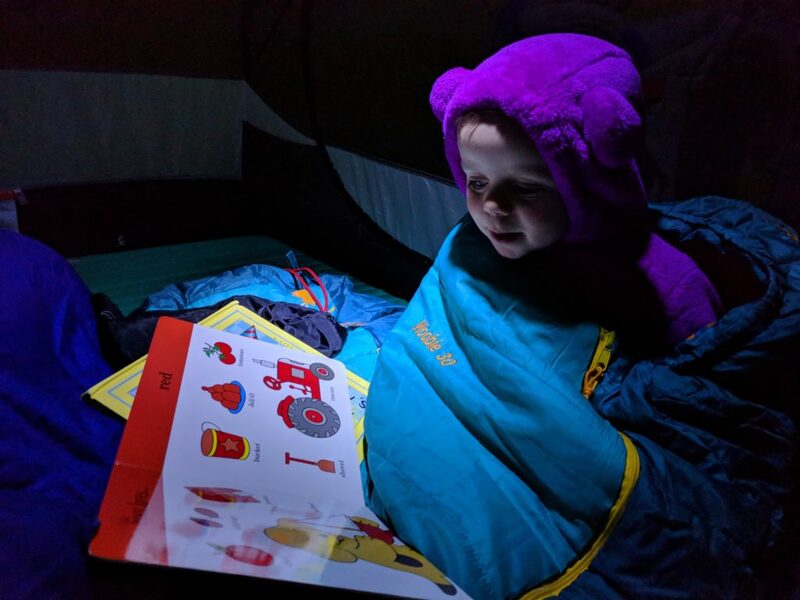 The trails seem like they’d work well for kids of varying ages just starting out on their first overnights: Flat, well marked, just long enough to be an accomplishment without being a slog. Alice is only 2+1/2 and loves to run & walk, but not for any significant distance. 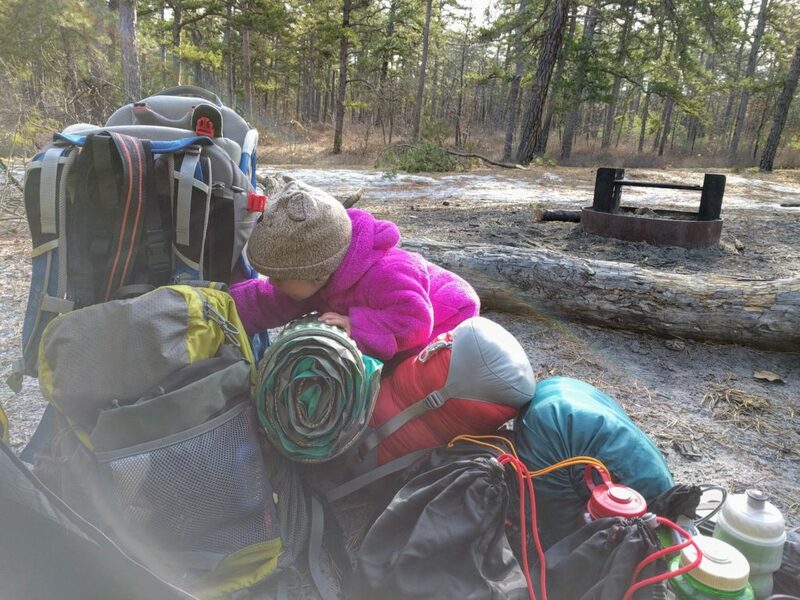 She’s still being carried on hikes, so I wanted a trail flat and short to test my jury-rigged setup to carry her & our gear without risking a death march. More importantly, especially this time of year and its weather, I wanted something that felt reasonably remote but which I could get us out of quickly. 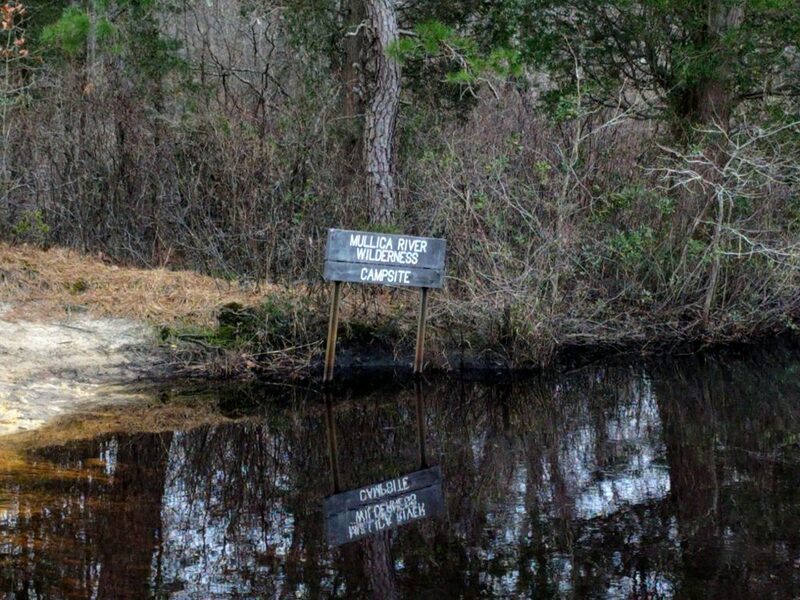 The Mullica River camp area fits that well. Ultimately, if we had a true emergency I could bundle her up in the carrier, abandon our gear, and literally run her back to the car in under an hour. Additionally, I wasn’t checking, but suspect we had cell coverage the whole time; certainly we did at the trailhead. There’s also enough activity and jeep road crossings that even at this time of year we’d have good odds to come across someone if we were in trouble. Detailed estimate is I was carrying a respectable 80–90+lbs. Alice and her carrier alone are 40lbs. The weight itself would be no problem in my full size backpacks. This arrangement though was fine but not especially comfortable. Her carrier was full past its weight limit, with no remaining space or realistic strap-on points. It held up very well, but I didn’t want to push it further and that required putting a lot into a front bag. A front bag though doesn’t rest on your hips at all (you wind up crossing your arms at your belly to support it a bit), putting a lot of weight hard on your shoulders. Meanwhile, the two bags pull in opposite directions to pinch your shoulder muscles. So the arrangement’s workable but not great, and I was helped quite a bit by being fit enough to make quick time of the short, easy hike (casually covering the 5.5mi each way in ~1:40). 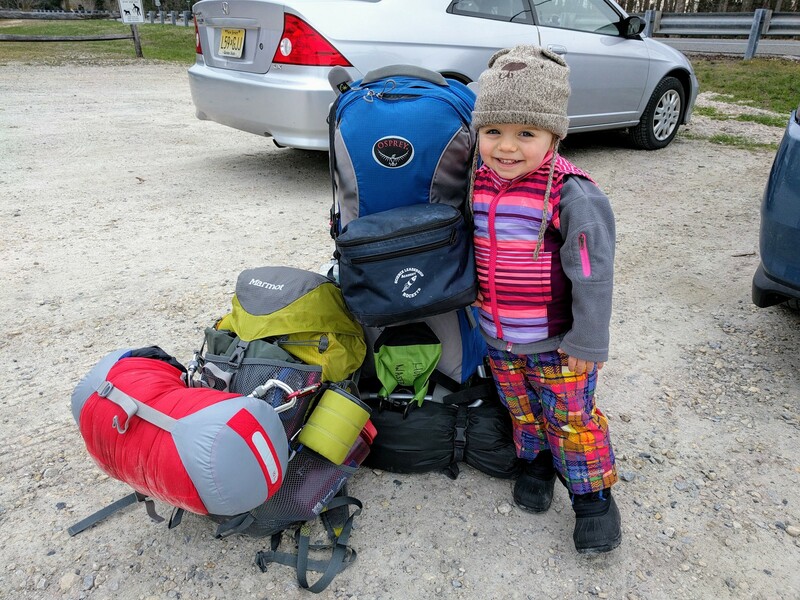 Unfortunately it’s not clear to me how the setup to carry her and all our gear could be made much better—other than the obvious answer of traveling with another person who can help carry stuff. Alice has a 2015 Poco Premium AG, which is amazing, and my research indicates there are no beefier child carriers on the market. The current model does have a few more liters of storage capacity, but not enough to make a huge difference in my case, and it has the same weight limit while being almost a pound heavier itself. Wearing an even more substantial pack on the front seems like it would be problematic: It’d start to interfere with your head, and I doubt you’d be able to get any kind of frame to sit right on your body, let alone fit around the carrier’s harness as well. There have been a couple purpose-built front-carrying backpacking bags come to market from time to time that seem useful for this application, but they don’t seem to stay in production long and are hard to acquire, and even the biggest ones have very limited capacity anyway. On the other hand, soon enough she’ll be able to walk this trail on her own feet, so this will be a somewhat short lived problem. Alice and I have always gone on lengthy hikes in basically all conditions, many much colder & longer than these. It’s a different game though when you’re not going back to Mommy and a warm house. 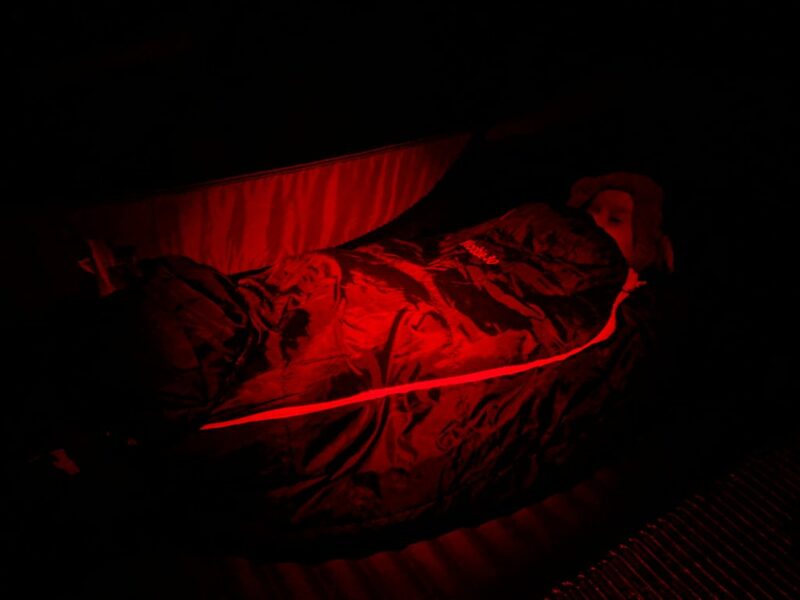 Thinking about being out overnight, for a while now she’d been in an unworkable middle ground: Too old and active to just stay swaddled up and cozy like an infant, too young to really understand anything or talk usefully. The turning point she’s reached in being ready to be out overnight in more than just ideal conditions is that at this point she can and will vocalize problems like being cold or hungry. Still, being out in rain or sleet unnecessarily didn’t sound fun or fair to her. So I was watching the Saturday morning “wintry mix” forecast closely all week, planning to leave around lunchtime so we could avoid committing until we actually saw how the day was playing out. We lucked out in the end with no precipitation all weekend. Temperature profile went as expected and worked out well: Pleasant mid-40s during the days, dropping to just kiss 30 overnight. I guess that might be considered cold (I think it’s pretty warm), but Alice has a legit, kid’s-sized, mummy-shaped sleeping bag, just missing collar & hood draws as they’d be a choking hazard. I rolled up and strapped the foot to reduce the empty space below her short legs. She also got my expensive 4-season, high-R inflatable sleeping pad which I don’t actually use in winter because I never want to sit around in true cold inflating it, or risking a puncture mid-trip with crampons and axes swinging around. Combine those with her adorable, very warm pink bear suit (importantly featuring built-in hood as well as footsies and mittens that open up when not needed), and she seemed fine temperature-wise throughout the night. She slept soundly enough that I was able to periodically shove her back into her sleeping bag without waking her as she squirmed out over time, just as she does her blankets at home. In the morning she was all smiles and ready to play. Snugged up heading into the coldest depths of the night. 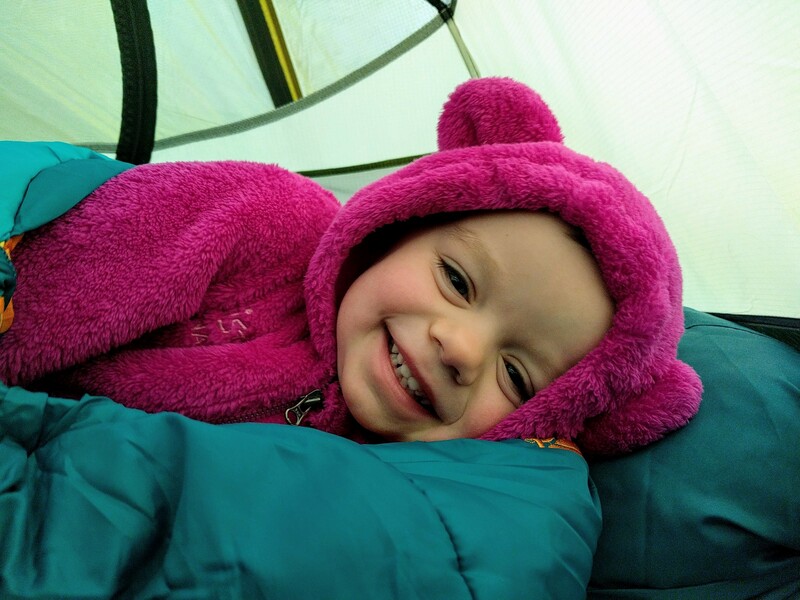 Our only real problem for the trip was that I fell asleep putting Alice to sleep singing lullabies in the dark, and had left a couple items unsecured outside the tent when she started quickly crashing. Just in the two or so hours I snoozed then, some animal grabbed a soft cooler I’d brought with milk, eggs, and yogurt for her. I couldn’t find any trace of it in the morning, which was somewhat impressive because it was fairly heavy. I’ve been informed that I’m required by law and galactic justice to make sure everyone knows that I, an apparently amateur camper, thereby lost my wife’s favorite hard plastic container that she’s been using on camping trips since before we met, in addition to her favorite cooler bag. Alice also wants you to know I lost her third favorite spoon as well as her eggs, and that she’s pretty sure a fox stole them. 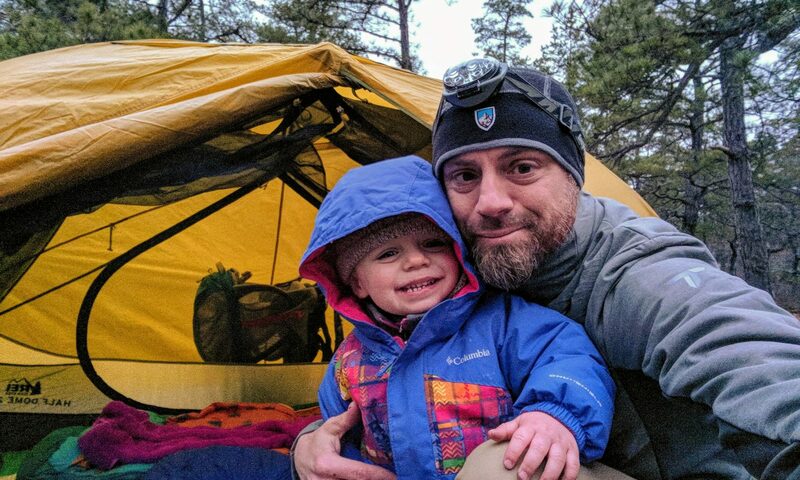 That gets at one of the larger aspects of the trip, tacking the usual hectic nature of toddler care onto the more or less exigent concerns of backpacking. Setting up camp was a manageable but relentless ping-pong back and forth between unpacking, keeping Alice out of the fire ring, putting up a little bit of the tent, getting her something to eat, putting up a bit more of the tent, helping her use the potty, putting back up the part of the tent she took apart, and so on. Granted, we timed our arrival tight such that we wouldn’t be sitting around long being cold before bedtime, so there was some time crunch that could be loosened. But there were enough matters requiring attention throughout the whole period from hitting camp to her & I falling asleep that I didn’t eat any dinner other than some egg yolks and tofu she didn’t want. 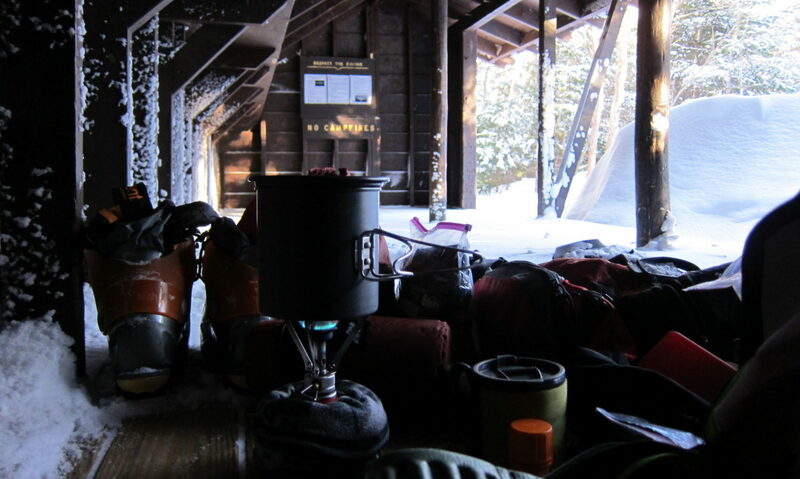 Continuing that thought, the whole experience is interesting to compare to solo backpacking. To me the latter has two hallmarks: 1) You need to be very cognizant of the quality of your decision making because there’s no one there to check it, and 2) The constant frisson of being truly alone—we’re a social species, we’re not supposed to step into the unknown on our own. With a toddler you don’t have that untethered feeling. But not only are you actually effectively on your own, you have more than double the usual worries, plus a little agent of distraction continuously working to disrupt and degrade your decision making. It’s quite different from either going solo or with other adults. Alice for her part seemed to like the trip a lot. She’s been going through a standard 2-year old’s phase of stubbornness, not listening, and light misbehaving. But she was notably better behaved this whole trip. It also seemed like when push came to shove she understood and followed the important things. 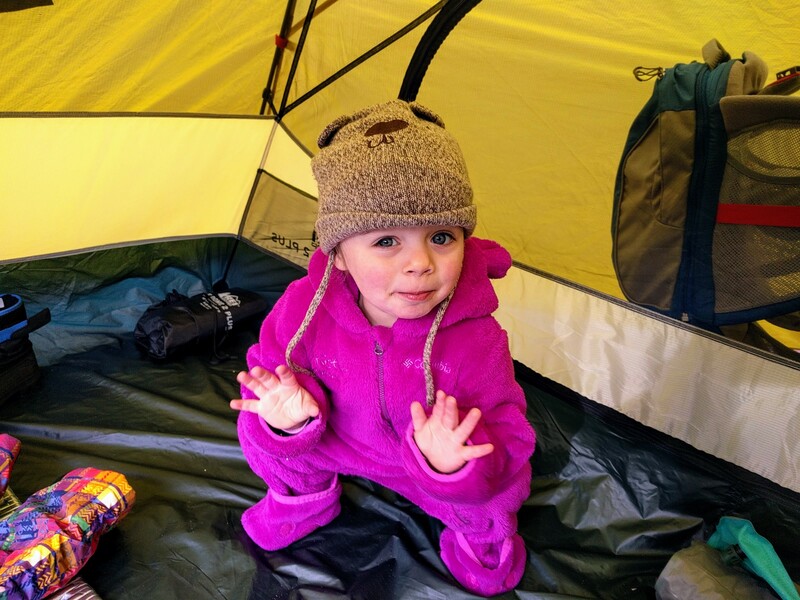 For example, despite fighting me all weekend about keeping her hands in her mittens, when the sun started going down Saturday and the cold settling in, she had her little paws steadfast in those mittens and tucked inside her sleeping bag without any push from me. As a sidenote, my friend F gave us Alice’s Osprey Poco carrier and it or similar is one of the best things you could give any kind of active person having a baby. 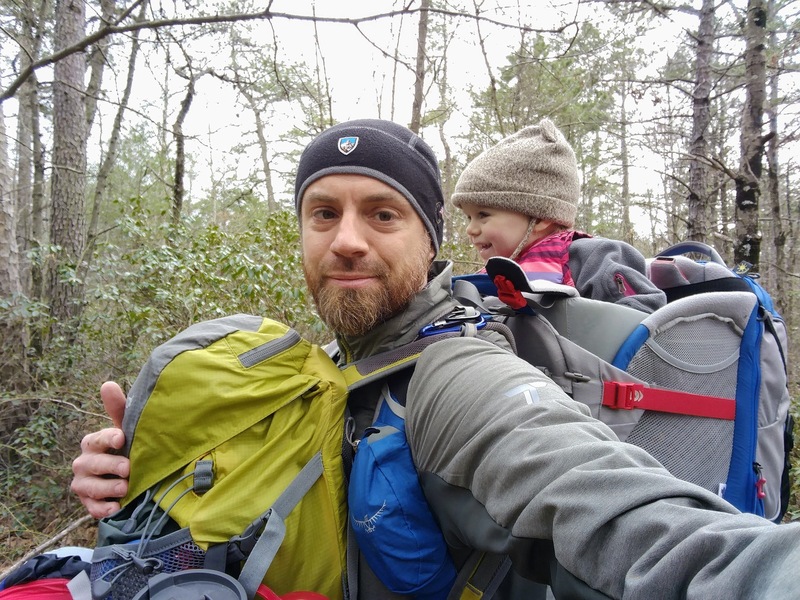 We’re definitely pushing some limits of it between activities like this duo backpacking and trail race running, but that’s a sign of how great the pack is that we can even consider these. It’s just as awesome for going to the zoo, parades, and on and on. 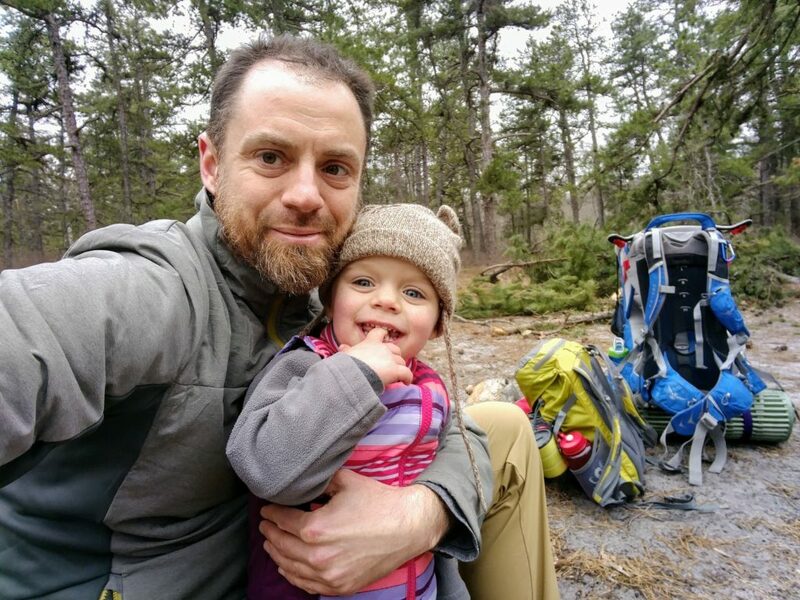 Absolutely amazing for getting outdoors with your baby, which is invaluable. There are more photos of our trip in the gallery here. A little pink bear caught on camera rummaging through our stuff while I packed up.